Curious about the bromance between this unlikely and evil couple, I couldn’t help but notice some surprising similarities. Looking at it from numerology's perspective, the statistics are off the charts. Pun intended. 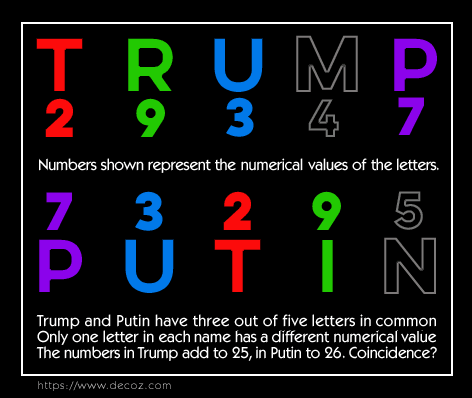 When you analyze the numerology behind the names Trump and Putin, you notice they have much in common. Each name has only five letters, yet they share three of them. Four of the five letters in each name have the same numerology value. Only one letter in each name does not share either the letter or the numerology value: the M in Trump and the N in Putin. They do, however, stand side-by-side in the English alphabet and look remarkably similar in shape. This is not a coincidence either. When two people who play similar and rather extreme roles on the world stage share this many symbols – even though their language, culture, and proximity are so dissimilar,– it behooves us to pay attention. Is it just coincidence or are there reflections we should recognize and seek to understand? Both men are over-sized alpha dogs who don’t take kindly to being criticized or overshadowed. If their buddy-buddy relationship changes to become competitive and confrontational, we could be in big trouble. A few other famous people: Bill Clinton, Barack Obama,Prince George, and Debbie and Carrie Fisher.